Back in October, the Schmidt Family Foundation announced its “Just Transit SF Challenge,” a contest to come up with good transit improvement ideas that can be implemented quickly. The three winners were announced this month. The $125,000 first prize went to RideScout and TransForm, which are partnering to improve transit using financial incentives. In many cities, off-peak transit tickets are discounted to encourage people to ride trains and buses when they are less crowded. This project exploits modern technology to take things further, offering discounts for people to ride when loads are light or even encouraging them to use a less direct route if it will reduce crowding. The grant will pay for the fare discounts the first year, during which the grantees will study to what extent financial incentives can work, using smart phone technology, to change travel patterns. After that, they’ll have to get SFMTA and BART to buy in. That may mean charging more at peak times and on heavily-crowded routes to offset the expense. Either way, it should bring in more revenue by making sure trains and buses have fewer empty seats on off-peak routes. In this sense, the project is trying to apply the kind of math airlines use to make sure planes don’t fly with empty seats. Another winner addresses a problem that’s all too tangible to anyone who has ever used Caltrain’s King Street Station. “Curbing the Caltrain Cluster,” which won a $50,000 award, is a joint project from Livable City and Lyft. How will it work? Suppose you get off your Caltrain and need a Lyft. The way things work now, you end up wandering past Muni buses, bikes, cars, and through the taxi queue trying to find your ride. “Curbing the Caltrain Cluster” proposes numbered stalls, so that when you call your Lyft, Uber, or whatever service, it also tells you to go to stall number 9, for example. So when a Lyft driver heads over to Caltrain and looks at his app, “It will say your rider will proceed to ‘X’ location,” explained Scott Reinstein, development and communications director for Livable City. The plan is also to separate cars, buses, and bikes as much as possible. “Most of the funding will be spent on outreach, design charrettes, public meetings and building stakeholder support,” said Reinstein. And, of course, “the design itself.” That may result mostly in better paint markings and signage. Ideally, the street design would also separate bicycle traffic from cars and buses discharging passengers. 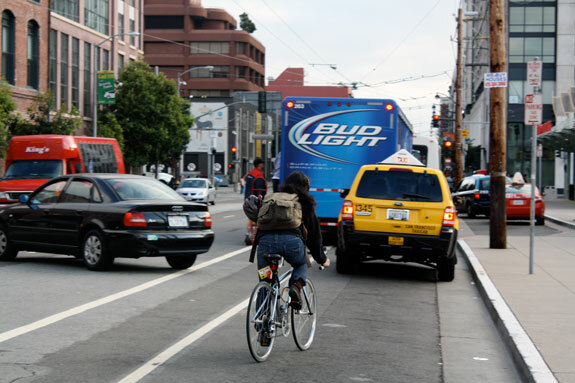 Reinstein noted that a raised or separated bike lane would cost more than the entire grant amount, but he hopes their efforts will get the SFMTA moving toward protected bike lanes on the approaches to the station. I hope this is helpful, but I’m also curious as to where these stalls can be painted. As it is, there is a long taxi lineup, bikeshares, motorcycle parking, and buses queuing all the way to 5th street. I ride past here twice a day, and the craziest thing I see all the time is U-turns. What can be done about the insane U-turns people pull here? Nothing can be done about the insane u-turns. The cops are forced to deal with cyclists rolling the stop sign at 5th and Townsend because complaints. Who is even ever complaining about 5th and Townsend? It’s not like a residential intersection like on the Wiggle. I’ll see a car pull into the Caltrain parking lot like maybe once a month. the people walking to their illegally parked tech buses. They should install a concrete curb along the median and soft hit posts in between each lane for 100 feet. Part of the traffic problem is people changing lanes at the last minute. Turning 4th and Townsend into a scramble intersection would really help. Right now, the problem is a train gets in and you have 400-500 people trying to get across 4th, Townsend, or both. This happens about every 10 minutes or so during the AM commute, and it’s equally bad during the PM commute. This is compounded by frustrated drivers trying to navigate the crowds, as well as the construction of the Central Subway. the best thing that could happen is removing the 280 stub. That would eliminate a lot of the traffic in that area. Townsend should be made 1 way east-bound, and make clearly marked white zone, taxi lanes, bus lanes and bike lanes. Transforming Townsend to 1-way would eliminate the biggest cluster there. How would you ride home? Put a 2 way parking protected bike path along the southern side of townsend between 4th and 7th street. There’s plenty of room for a 13′ wide 2-way bike path there. All vehicle traffic should be one-way with loading islands for busses and taxis just like every other train station and airport loading zone on this planet. Creating a loading zone for a train station along 2 perpendicular 2-way streets is a clusterfuk!